Left mouse on blue text to view supporting picture and text. How Do I get to Mark's Place Moorea? On arrival at Tahiti’s International Airport, you have 2 choices of transportation to get to the ferry port. Either taxi or bus. Taxi is probably the best option as bus’s don’t accommodate a lot of luggage and sometimes can be unreliable to the posted time table. When requesting a taxi or using the bus service say that you want to go to the ‘Moorea ferry port’. There are 2 types of boat service operating between Papeete and Moorea, fast boat (Catamaran) taking ½ hour and ferry taking 1 hour. Left mouse this hyperlink to see the ferry timetables. If you have a prior arranged pickup with Mark he will be waiting for you. Mark offers pickup and delivery to and from either the Moorea ferry port or airport: This service has to be arranged and agreed at the time of your booking. Mark's transportation costs are, from the port: 2500cfp up to 4 people, from the airport: 3500cfp up to 4 people. The cost of a trip to Marks Place from the port should be around 3500cfp up to 4 people. The cost of a trip from the airport should be around 4500cfp up to 4 people. if you have luggage on the trolley inside the boat, do not wait for it to be unloaded, go directly to the bus drivers and speak to the one going towards "Haapiti" and he will wait for you to get your luggage from the trolley. The unloading of the luggage trolley from the ferry can take a bit of time and the drivers sometimes do not wait very long after the boat arrives. The cost for a bus trip is 300cfp per person. Cars and scooters are available for rental at ferry port or airport, but can ONLY be delivered by previous booking. Left mouse this hyperlink to view a map showing how to get to Mark's Place. What facilities are in the bungalows? Each bungalow has a full kitchen with all cooking requirements including stove, refrigerator, microwave, toaster, coffee machine, hot water, cutlery, plates, glasses mugs etc enabling food to be prepared to your personal style. Linen is changed every 4 days. Mosquito nets are not provided. We are 200 metres back from the coastal road. 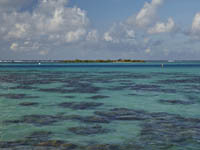 The inner lagoon and reef is accessible by kayak at the end of our drive way. The nearest bathing beach(Panapo or Pineapple beach) is 4km away, 7 mins by car or scooter, 15 mins by push bike. This is a wonderful white sand beach that offers great swimmimng and snorkelling, a restaraunt overlooking the beach, chairs, toilets, showers and shade all available for your use. 'Marks Place' does free delivery to Pineapple beach and then you can walk back along the beach after an enjoyable day swimming and snorkelling. 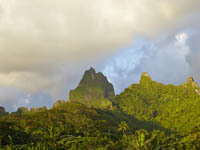 Like the rest of the Tahitian Islands, Moorea’s weather is tropical and can be summed up in just two seasons: wet and dry. 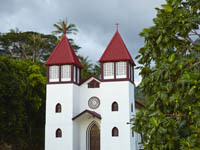 The capital city of Papeete reports an average yearly rain fall of 1800mm. The wet season generally runs between the months of November to April. During this time, you can expect very high humidity with brief and frequent storms. The wet season is also referred to as the “off season.” If you’re looking to do Tahiti on a budget, you’ll probably find better deals this time of year and you're likely to have a fair amount of sunshine. Temperatures will range from 27 - 30 degrees C, with the hottest months being February and March. Day to night temperature fluctuations are minimal. The dry season runs from May to October and you can expect less rain, although occasional nighttime downpours are not uncommon. This time of year is the “high season” and you should expect to encounter more tourists on your trip than in the off season. July is usually the most crowded time of the time. If you're going to Tahiti to scuba, the dry season is probably the best time to go because the visibility is better. This is the Polynesian winter. Temperatures generally range from between 24-28 degrees C, and rain is rare. Day to night temperature fluctuations are minimal. Although the year round temperatures remain tropical, trade winds are usually blowing, which will help keep you cool. For this reason, you may want to pack a light sweater or jacket, especially for the evening. What is the surf like on Moorea? Most of the surf breaks on Moorea are on the passes. The passes are breaks in the outer reef that surrounds the island. The break in front of Marks(Haapiti) is about 1km from shore. Its a very consistent break and can handle some size. It works on south swell generated from depressions that go under New Zealand. When the swell maxes Haapiti out go round to Taeme which works of big south swells that wrap round the island. See the activity/surf page for more detail. How close to restaurants and food shops are you? The closest sit down restaurant is a Pizza parlour 5 mins away by push bike. Mark has an arrangement with the local Pizzeria and Restaurants orffering free pickup and delivery on request. A number of other restaurants are a 15min car or scooter drive away. 3 stores Magasin(Super Market) 5 mins away by push bike with all the daily staples available, baguette, milk, fruit and vegetables etc. Mark has an arrangement with the local Pizzeria and Restaurants orffering free pickup and delivery on request. Also in close proximity is a snack, a fish market and roulots. Do you offer any security for valuables? We are happy to store your valuables in our safe. Do you hire cars and scooters? We don't directly hire cars or scooters but can help you organise the hire of these. We have an arrangement where Avis drop off and pick up vehicles to and from Marks Place. This also applies to scooters from the RENT A BIKE & SCOOTER depot at Petit Village. If you intend to arrange a rental car at either the ferry terminal or the airport be sure to mention you are staying at Marks Place to receive their special rate. Do you hire bikes, kayaks and SUP's? Yes we have a number of push bikes and kayaks for hire at 1000 cfp per day & per person. We also rent Masks and fins at 500cfp per day & per person. SUP's (Stand up Paddle Boards) are available for hire close by. All bungalows are serviced by WIFI which is free. What are your power voltages? The power voltage used in French Polynesia is 220 volts. All bungalows are equipped with voltage power boards with international pin configurations. Do you prepare any meals? No, we do no catering.